The local strawberries are just coming into season here, and so I’ve got a fridge full of them! I’m saving a punnet for a strawberry/rhubarb tart, but I thought I’d try throw some into a salad too. Along with some leftover pickled onions (from a chorizo taco salad I made last week) and a walnut vinaigrette, this was a great quick salad that balanced out our lunch of grilled farmers’ sausages. I was going to throw in a donut peach, but I’m saving it for my afternoon snack for after today’s students. I think nectarines or plums would be good here too! Fruit + Salad. Who knew? So good. A gorgeously fresh salad, which is a great contrast to a rich main course. 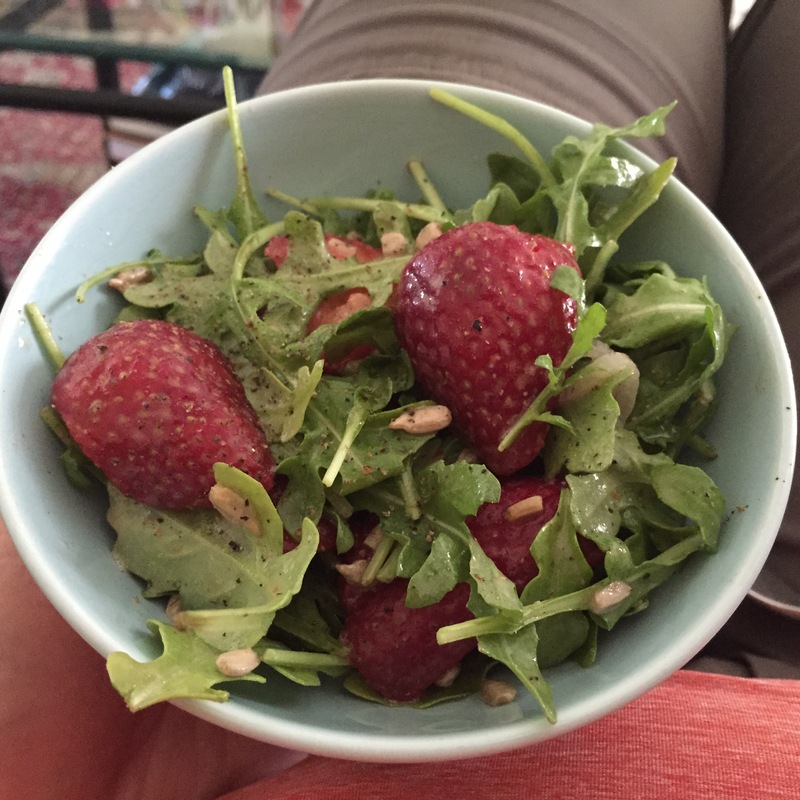 Local strawberries make everything better, especially this salad. Serves 2 as a side dish. In a large bowl, whisk together the dressing: walnut oil, lemon juice, Dijon mustard, and salt and pepper. Add the arugula and toss to coat the leaves with dressing. Top with pickled onions, sunflower seeds, and an extra crack of freshly ground pepper, and enjoy! salads with strawberries are the best!! Agreed! I definitely have a new strawberry obsession! We just did an experiment on our blog to find the top ten gluten free recipes and this one made the list. We loved that it was simple to make and that the ingredients were affordable for small budgets. We also really love strawberries, truly an amazing recipe.